Click Here for Student Log-In! Active or Retired Military or Law Enforcement $50 Coupon. Must provide proof of service prior to class starting. Use Coupon Code: MIL50 (military) or LE50 (law enforcement) at time of online enrollment. Thank you for your service! You can reach our office staff Monday-Friday on-site or via phone (253-256-7678). If you need assistance on Saturday, please contact our Graham location (253-875-0911). No more waiting in long lines for Washington State DOL tests! Check the “WA State Testing” tab below! We are a Washington State Approved Testing Location! We offer both the Road (Skills) Test and the Knowledge (Written) Test on a walk-in and appointment basis. You can register for an appointment under the testing tab below or by calling our office. Please remember to bring your Washington State DOL PIC number along with proper identification as outlined by Washington State DOL. Apply for your DOL PIC number. WE NOW OFFER WALK-IN KNOWLEDGE TESTING AND ROAD TESTING EVERY FRIDAY! Knowledge Tests are given from 10AM-11AM and Road Tests are from 11AM-5PM every Friday. We are located directly across from McDonalds on the one-way street (2nd St NE). Knowledge Testing: Monday/Thursday 11AM-5PM, Tuesday/Wednesday 1PM-5PM. We offer walk-in Knowledge Testing every Friday at 10AM; please arrive promptly at 10AM for check-in; must be checked-in no later than 10:15AM to test. Road Testing: Tuesday/Wednesday 11AM-5PM (appointment required) or Friday 11AM-5PM (walk-in). Did you know we offer Private Driving Lessons for Adults and Teens? Register today by clicking here!! We have teen classes starting every month including occasional weekend classes! Private Driving Lessons have been upgraded!! When registering for this bundle package, you will receive Three 1-hour driving lessons with our instructors and a warm-up and road test in our vehicle. Price $295. Our Washington online driver’s ed course is used as supplemental driver education. Our program provides great supplemental training for your written test. You will take a virtual road trip across the U.S., see many great sites, and learn about driving from the experts at 911 Driving School. 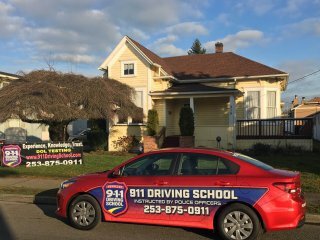 Practice tests are included and you will be well prepared to pass your Washington DOL “Drivers Knowledge test” and be on the road to being a safe driver. *Does not replace Washington State requirements for driver education that is “Approved and Regulated by the Department Of Motor Vehicles”. Start and stop anytime in the course and go back and review challenging sections 24/7 to ensure your success. No eyeball boredom in this course, it’s filled with engaging graphics, video, driving maneuvers and lessons. Each section has multiple tests all specifically designed for retention and strengthening your driving knowledge. Our final driver’s ed course test can be taken multiple times and can be used as a practice test for your BMV driver’s permit test. Same great experience on a laptop or tablet. We are confident you will not find a better supplemental Washington online driver’s ed course. This course does not include “Certificate of Completion of A Driver Education Classroom Course”. This course is designed for adult drivers who would like some extra practice behind-the-wheel and would like a refresher course covering rules of the road. Spend time with an instructor, who will show you how to make better decisions while driving and review the basic rules of the road. This course includes: 30 hours in class, 4 hours of driving with a police officer, and 4 hours of driving observation. Active or Retired Military or Law Enforcement $50 Coupon. Must provide proof of service prior to class starting.